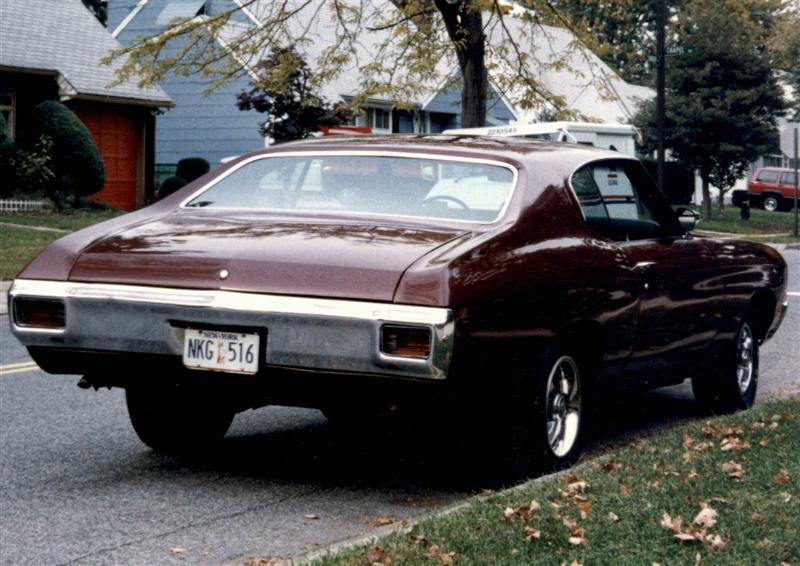 Back when I was learning automotive refinishing in vocational school, turbine spray systems had just entered the market. Soon after, I bought an HVLP Accuspray system including turbine, gun, and hose. 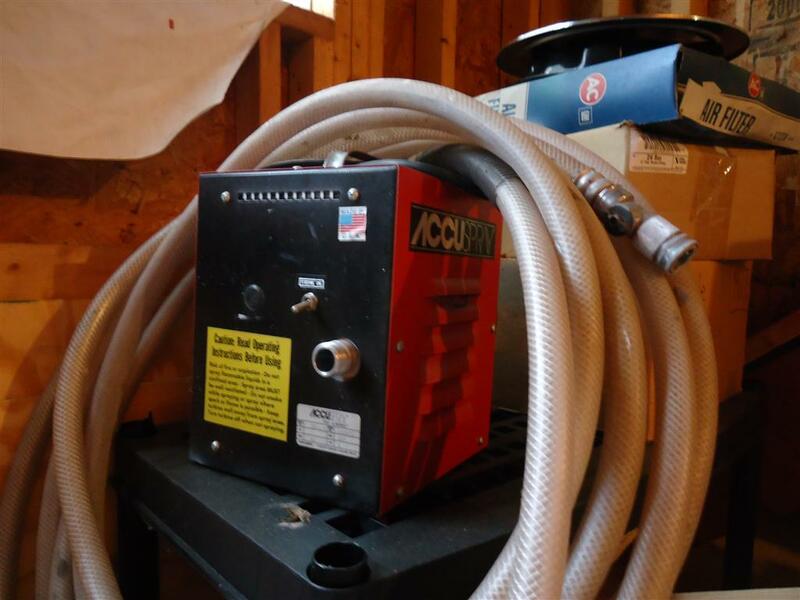 It's not that I didn't have an air compressor in my garage, I did, but after spraying a few cars with my Binks-7 copy and 20-gallon Sears compressor, I wanted something better. Buying a bigger compressor and a real HVLP spray gun would cost nearly as much as a complete HVLP turbine system. The turbine system just made sense. Over the years, I painted about a dozen cars (and a few assorted trucks) with my Accuspray HVLP turbine system. 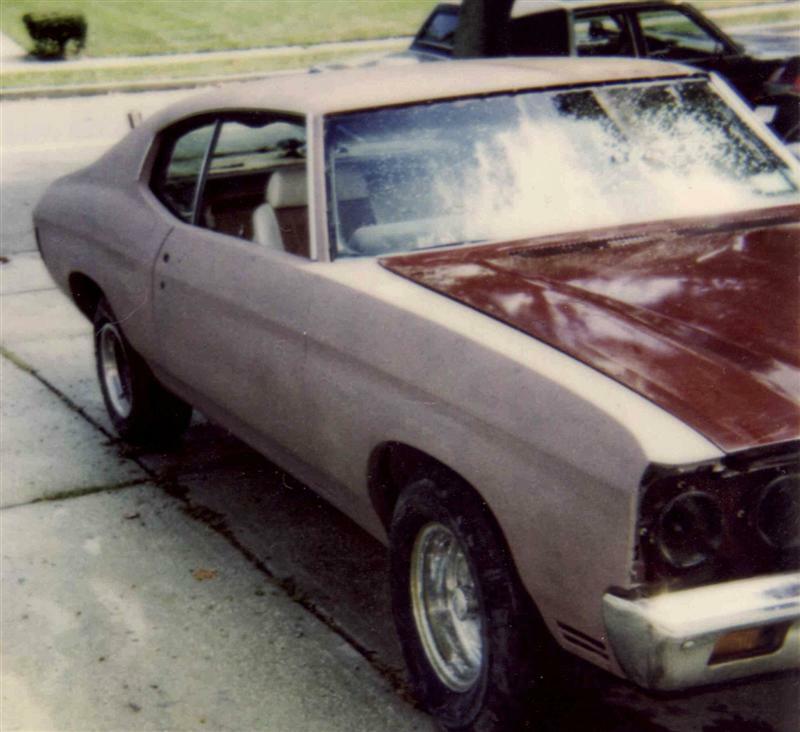 The first car I painted with it was my old 1970 Chevelle which I sprayed in my home garage. With a conventional spray gun, you need a large air compressor, paint gun, an air hose, and a moisture separator as minimum requirements for painting your own car. Because a paint gun has a much higher duty-cycle than most air tools, more air is needed, requiring a smaller compressor to run longer. This builds up more heat and causes moisture (condensation) to get in the air lines. Nothing ruins a great spray pattern as much as moisture in the air line. An HVLP turbine unit supplies dry air at low pressure, instead of high pressure from your overworked compressor. The result is clean dry air to your spray gun. All turbine-powered spray guns are true high-volume low-pressure (HVLP) systems. A couple of side benefits is that over-spray is kept to a minimum with HVLP spray guns, which saves paint. And you don't have to worry about oil getting into the air lines. I still have my Accuspray turbine system that I bought back in the nineties, and it's seen plenty of use. Trouble is, Accuspray was bought out by another company some years back, and replacement parts are near impossible to find. And it's pretty loud. It sounds like an old vacuum cleaner when running! Which brought me on my search to find the best HVLP turbine for automotive use. The Fuju brand seems to be a popular one and had best reviews, so I checked them out first. The entry-level Fuji turbine sprayer is the DIY Semi-Pro. It features a lightweight, portable turbine that has more power than other DIY systems in it's price range. They offer three entry-level sets, which include the turbine, HVLP gun, and a 25-foot hose with quick-connect couplings. The hose length should give enough range for small to medium cars. For larger cars and trucks, you may need to move the turbine unit once or twice during the painting process. 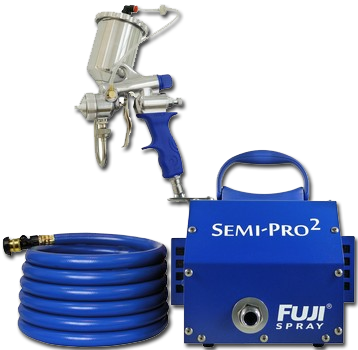 The spray gun included with the Semi-Pro Series 2203G is Fuji’s M-model, one step below their top of the line T-series guns. It doesn't have as many adjustable features as the T-series, but it does have the same non-bleed spray cap, and a stainless steel nozzle and needle. The pattern control knob is fully adjustable to widen or narrow the fan spray. The main drawback of the Semi-Pro series is the two-stage turbine is only capable of 5.0 PSI. If you're painting small panels or motorcycle tanks and fenders, the 2203G Fuji will be perfectly suitable. To correctly spray certain automotive finishes, such as clear coats, you need a higher degree of atomization that only comes with more powerful turbines. For the professional body man or for bigger jobs, either a four-stage or five-stage system is preferred. The the DIYer, the extra power provides the necessary pressure to spray higher viscosity primers and heavier enamels. 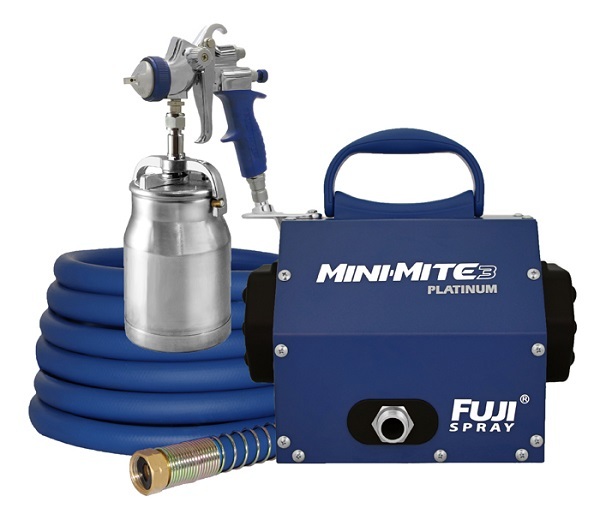 If you're shopping for a HVLP system in the $900 price range, the Fuji Mini-Mite spray systems easily stand out. The four-stage turbine has a range of 6.5 PSI to 8.5 PSI. Although these mid-line turbines were primarily designed for mobile use, they are also suitable for your home garage. The Mini-Mite series is a good compromise between the entry-level turbines and professional-use turbines. 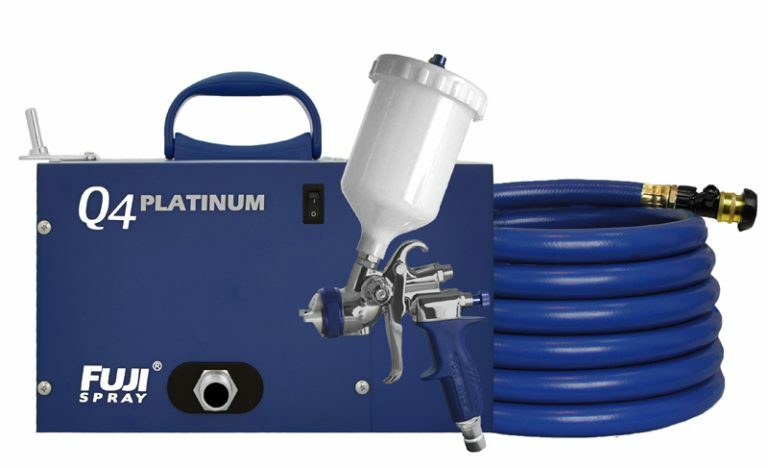 As shipped, Fuji HVLP spray guns are fitted with a 1.3mm air cap, which is good for most automotive paint. For clear coats, a smaller tip size will give better results. Some primers may require larger tips. Six different air cap set sizes are available from 0.8mm to 2.0mm. I have sprayed with both types of spray guns, and generally prefer gravity-feed (cup on top) over pot-style (cup on bottom). Fuji HVLP guns come with either a gravity-fed cup or a pot-style cup. Both style cups are aluminium. All Fuji Turbine systems are made in Canada and covered by a two-year warranty. 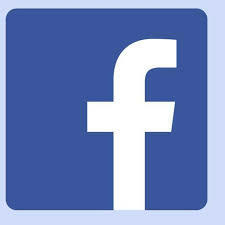 A 20-page instruction manual is included with all models. If you're a professional or plan to spend a lot of time painting, the Fuji Q-Platinum series are the best choice. Considered the quietest operating turbine on the market today, the Fuji Q-Platinum is designed for professional automotive shops. Quiet operation gives less overall fatigue. Featured on the Q-Platinum turbine is a turbine speed control switch, allowing you to taper the turbine speed for optimum results. A patented fan pattern control on the gun has three pattern orientations (horizontal, vertical, and circular). Like the Fuji Mini-Mites, operating range is 6.5 PSI to 9.5 PSI. While many professional automotive turbine spray systems are too expensive for the average DIYer, technology has made them less costly over the years. Your budget will most likely decide which turbine spray system is best for you. Like other automotive tools, buy the best you can afford. Aside from cars, trucks, and motorcycles, turbine spray systems are also well-suited for DIY spray painting projects, such as furniture, interior room walls, and wood and metal crafts. The techniques are slightly different as when painting a car. Safety hazards when painting your car are very real. The chemicals in today's paints are dangerous and can be absorbed through your skin and eyes. The EPA states that the health risks of VOCs include: eye, nose, and throat irritation, headaches, loss of coordination, nausea, damage to liver, kidney, and central nervous system. Use caution and common sense while painting.